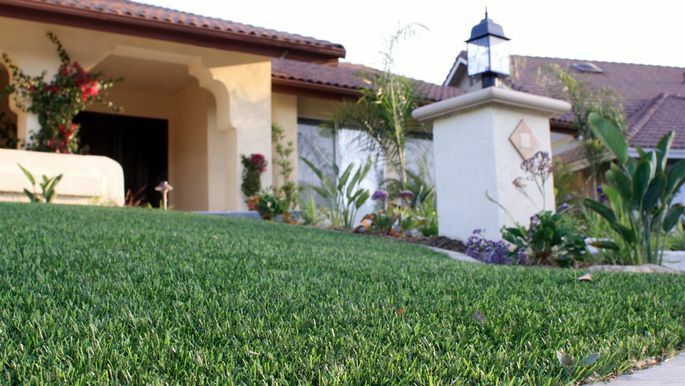 One of the most viable, low-maintenance alternatives to a natural lawn is artificial grass. And if you’re a homeowner who loves the look of a lush lawn, but fears and loathes the upkeep required to make it a reality, this landscaping solution might be a godsend. Artificial grass comes in a number of textures, finishes, colors, and blade shapes. So how do you know if you should go for it? We asked several experts to weigh in on the benefits and disadvantages of having artificial grass installed on your property. Here are the five factors to keep in mind when deciding if this is the right landscaping move for you. Say goodbye to your sprinklers! One of the biggest selling points for artificial grass is that it doesn’t need constant watering to keep it green. “Artificial grass has a certain appeal for homeowners who are overwhelmed by the idea of regular lawn maintenance,” says Rob Turley, general manager at Custom Turf in Finleyville, PA. You don’t have to fertilize or mow artificial grass, and it will be green all year long. It’s suited for all climates, but it’s especially useful in dry, arid environments, where it’s difficult to grow grass. Artificial grass isn’t completely maintenance free, however: You’ll need to rinse your lawn to clear away dirt and debris, “And you’ll need to groom your lawn to fluff the blades of grass and keep it from becoming matted,” Turley says. Rainfall and sunlight can affect the health of natural grass. But when it comes to artificial grass, the weather will have very little bearing on its appearance. It’s resilient and holds up to any type of weather, including rain and snow. Because it has such good drainage, it dries faster than natural grass. So if there’s a rain shower, it dries up after a few minutes. Reality check: When artificial grass reaches the point of being uncomfortably hot, it’s probably too hot to be outside rolling around anyway. There’s no denying that natural grass is good for the environment. It increases soil stability, removes dust from the air and water, and, like other vegetative sources, it also cools the air. Artificial grass, on the other hand, doesn’t provide even a fraction of the ecological benefits of natural grass. The major concerns come from the artificial infill—the rubber crumb typically made of scrap tires—that’s used to improve the stability of the grass. Many concerns have been raised about the adverse effects that rubber crumb can have on the environment and health of those who come in contact with it. Studies show that rubber crumb contains hazardous materials, according to the Yale School of Public Health, which has ongoing research on the volatility of crumb rubber. Fortunately, certain artificial turf companies offer other infill options, like acrylic polymer-coated sand, coconut fibers, or cork. At the other end of the spectrum, caring for natural lawns can also be problematic for the environment. “Mowers contribute to carbon pollution, and fertilizer can run off into local waterways,” says Turley. And, as most people know, watering a lawn can be extremely wasteful. According to the EPA, Americans use a combined 9 billion gallons of water each day on landscape irrigation. But the agency estimates that 50% of that is actually wasted as a result of evaporation, wind, or runoff—all caused by inefficient irrigation. “If everyone had artificial grass, that would work out to nearly 14,000 Olympic swimming pools’ worth of water saved every year,” says Vander Veen. If you want your artificial lawn to look like real grass, be prepared to pay for that natural look. “Artificial lawn materials are usually pricey and require special equipment to install the grass,” says Turley. You’ll pay anywhere between $8 and $20 per square foot for artificial grass. While that’s quite a bit more than the average cost of natural grass (about $0.25 per square foot), most turf companies place the life span of their grasses between 15 to 20 years. So, in the long run, artificial grass might be cheaper. Unless this is your forever home, you should consider how artificial grass will affect your resale value. If your entire yard consists of artificial grass—especially in the front—potential buyers are either going to love it or hate it. “I think it will turn most buyers off, except in some markets where it is more acceptable, like very arid climates in the Southwest,” says John Blackman, a real estate agent, developer, and investor at Heart of Austin Homes Team in Austin, TX. Consult with local landscape architects and chat with your neighbors on whether they think this choice will improve the value of your home, or have the opposite effect.